This was truly an Asian food weekend for me Thai, Chinese, and Japanese. 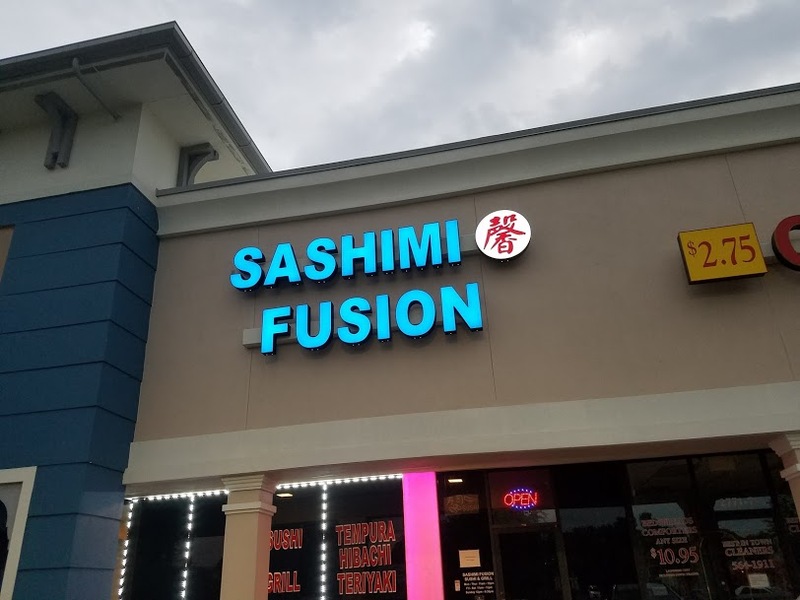 Sushi is one of my guilty pleasures and Sashimi Fusion is close enough and good enough to make the trip when the taste buds call. This spot opened in 2013 and I have been a patron ever since. 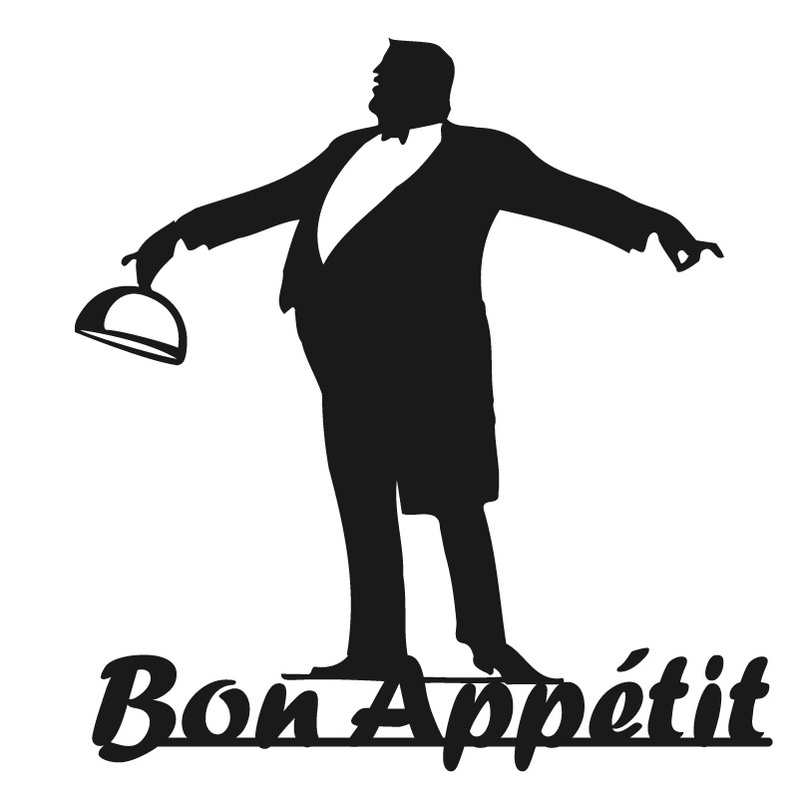 The end unit in one of Jacksonville many strip malls, surrounded by a few fast food spots, this is a gem. 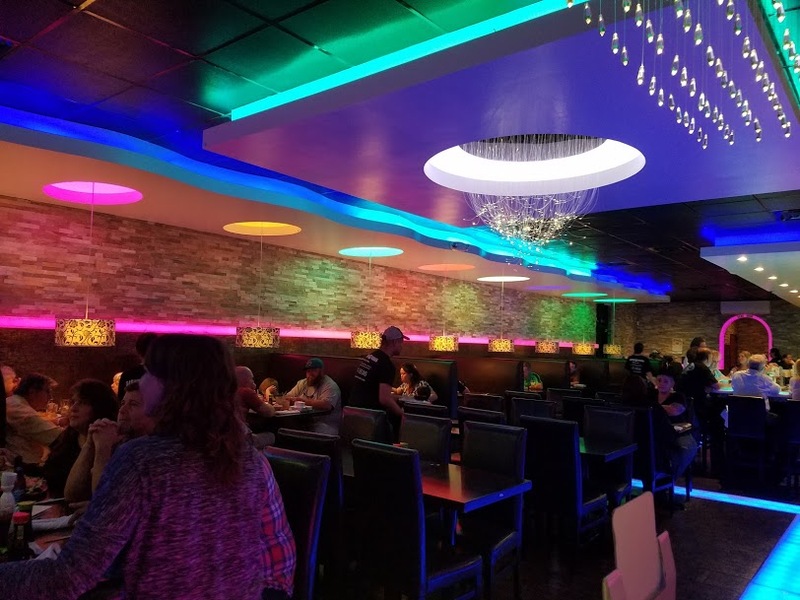 Interior new modern neon look. 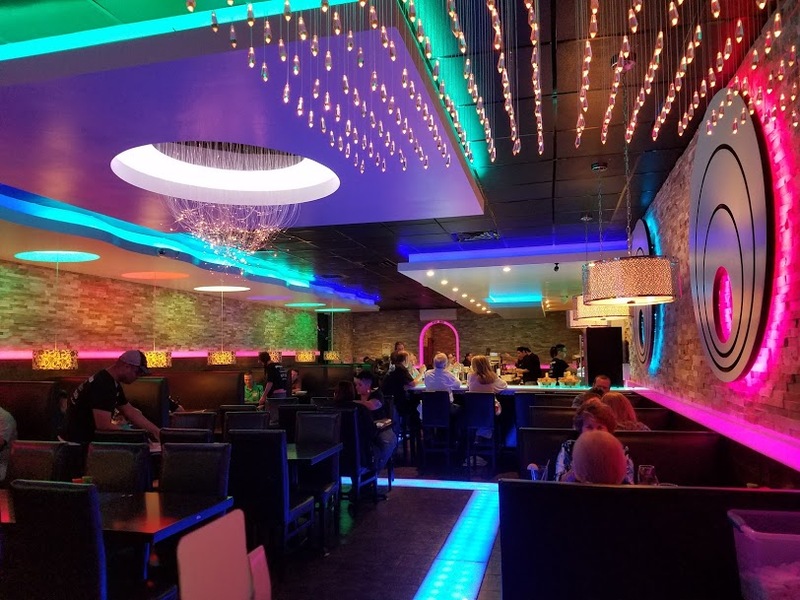 On my first visit I thought I had entered a lounge, but after time and so many other spots using this lighting I have come to enjoy the look and feel. Open the door and the light hits you! On this particular night the restaurant was packed, so I selected the last seat at the Sushi/Drink bar, took a few moments to scan the menu and made my choices. 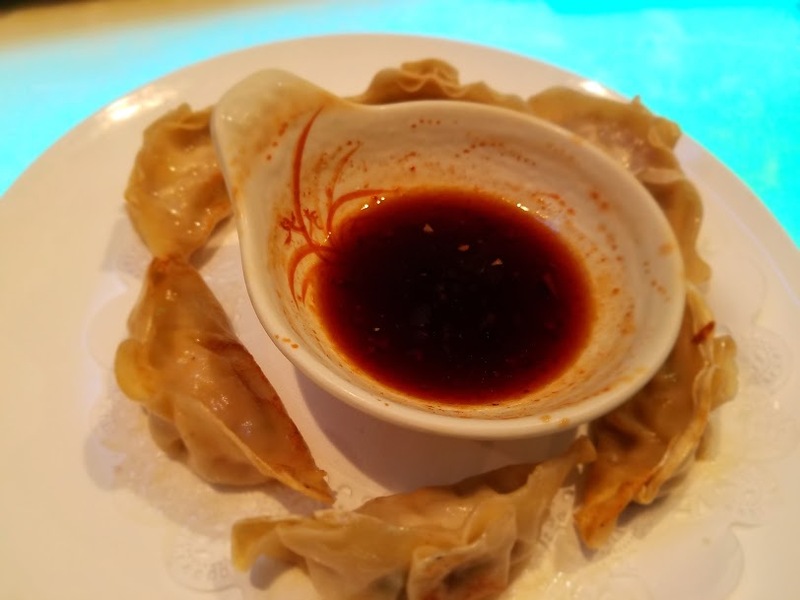 Starting with Gyoza, the pan fried Japanese dumplings. These were cold on arrival, center being just warm. I was not in love with the dish. 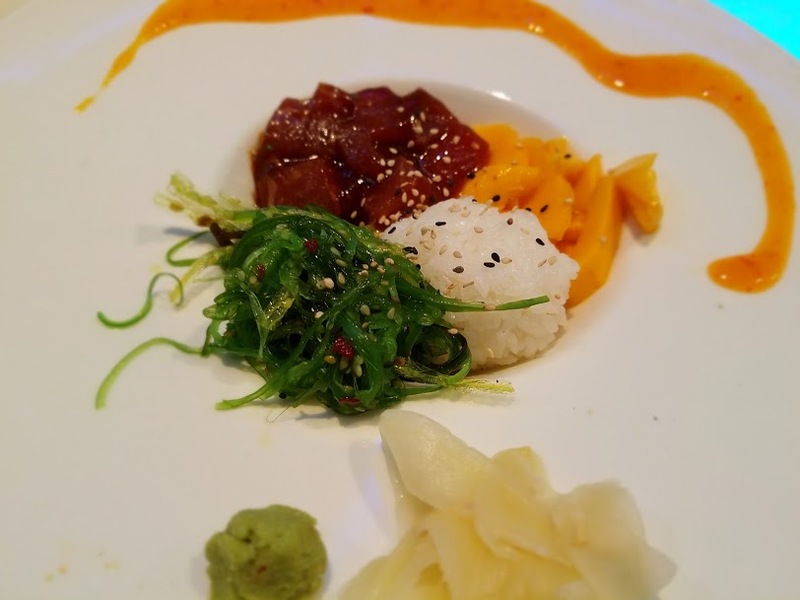 My next option proved to be more delightful, the Ahi Tower, a deconstructed dish of Ahi Tuna, mango, seaweed salad, sushi rice with “chef special sauce.” Eye appealing and tasty. 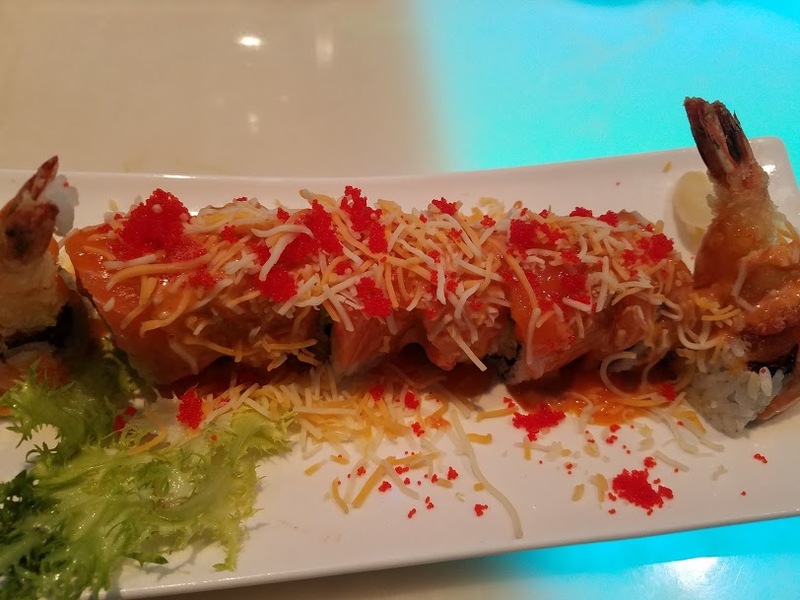 When it came time for Sushi, I went with the nights special offering a Crab and Tempura Asparagus roll, This was truly a treat to the eyes. Composed of salmon, white fish, around tempura asparagus. Tasty and pleasant in the mouth, the softness of the salmon with the crunch of the vegetables, was a nice mix. I paired it with Shrimp sauce for dipping. In addition a Volcano Roll was also ordered. 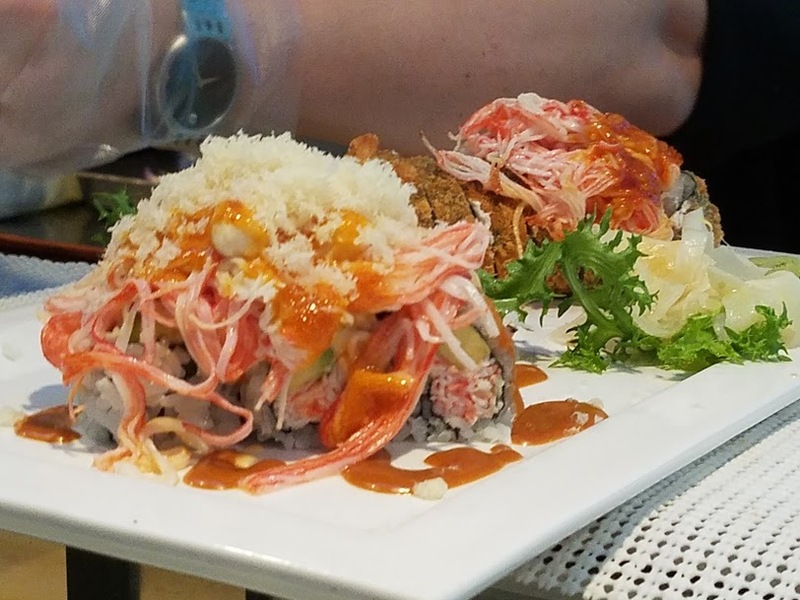 This concoction a brilliant mix of baked scallops and krab, on top of a California roll, roe, scallions with a spicy mayo and peka sauce. I have no clue what peka sauce is but I can tell you it’s tasty, and the entire dish a bit more complex than the roll. Overall, this was a delightful experience at a price point that pleases as well. This is a great spot for groups, and if you live it this area and have not tried this spot it may be time. I don’t think you will be disappointed.